Sometimes I think it’s still soup season, and then the weather decides it was to be on the warmer side again when I make a pot of soup. It’s so hard to predict how it’s going to be because mother nature is constantly changing. Ugh! Oh well. 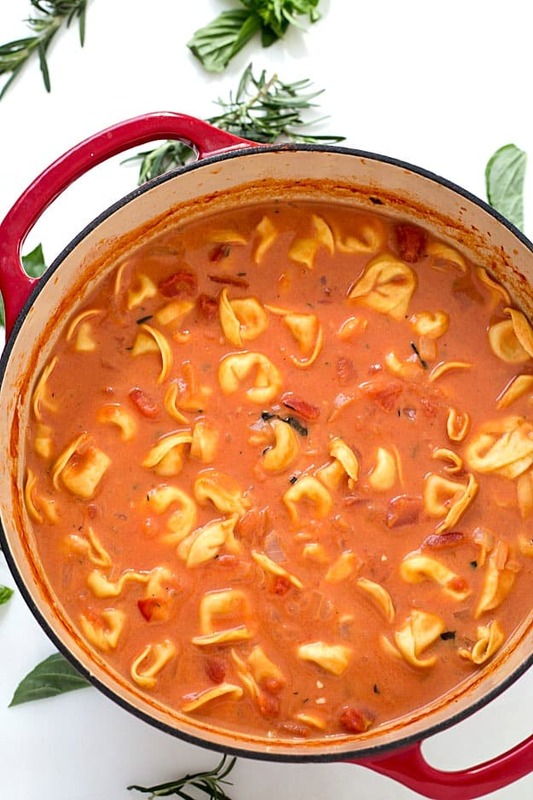 My hubby is still going to enjoy this one pot creamy tomato tortellini soup! Even though I would like to face plant into a bowl of this soup, I am going to have to pass because I am dieting. My willpower is starting to get stronger each and every day. I would LOVE a big bowl of this soup with a buttered and toasted slice of bread! I did taste it now and then when I was making it, so I know it’s delicious. If you love one-pot soups, you are going to LOVE one-pot tomato and basil tortellini soup or my one-pot creamy sausage and potato soup! I immediately know what ingredients I wanted to use to resemble a condensed tomato soup: springs of fresh rosemary, fresh basil, dried oregano, and dried thyme. Yep. Those are your typical Italian soup and sauce basic. Not to worry if you do not have fresh rosemary or basil, you can find the measurements for dried. Love one-pot pasta dishes? Try our 15-minute one-pot taco pasta, 20-minute Tuscan chicken with penne pasta, or our one-pot summer vegetable pasta – to die for! 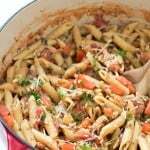 Every soup or pasta dish I make I love to use my dutch oven. If you do not own one, it is my most used kitchen pot. It keeps things an even cooking temperature since it is made out of cast iron and perfect for throwing into the oven. Hands down…the BEST!! If you do not make your chicken stock from scratch, I highly recommend this brand of chicken stock. I always like to get the unsalted kind because I like to add salt to my taste. 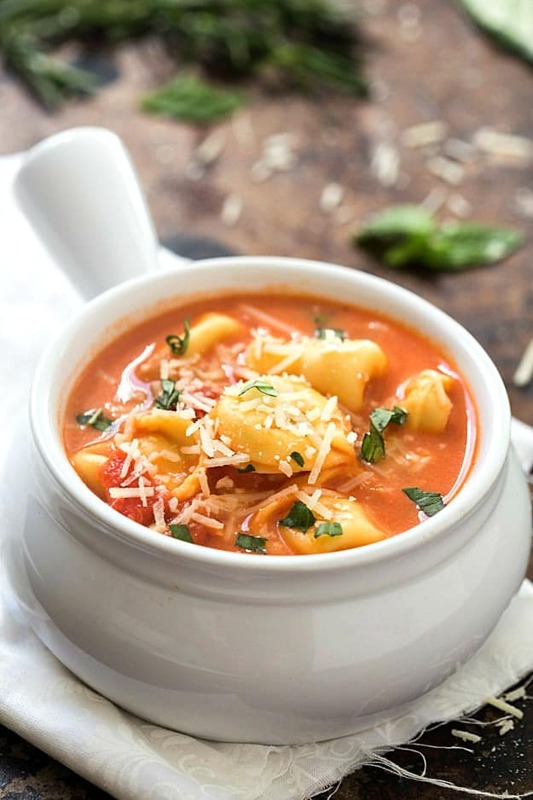 Place the three-cheese tortellini into the soup and cook for 12-15 minutes or until the tortellini are tender and cooked through. If you do this in the slow cooker, does the heavy cream curdle? I would recommend adding the tortellini and the heavy cream last. They only need approximately 15-20 minutes. Put it in the last 30 minutes on low! It should be fine then. I made a copy-cat Olive Garden soup in a slow cooker and it worked beautifully! Second time making this soup and it was awesome! Didn’t change a thing! There are plenty of leftovers for tomorrow too. Thanks for sharing! So glad you enjoyed it, Lecia! We cannot get enough of it either! So good. I also added about 6 large celery sticks, about4C (a small bag) of spinich at the end. Used ‘half n half instead of heavy cream.& tortellini also at the last 15minutez. A great recipe to just explore your veggie creativity…..had fun with this one. Thanks! ? I’ve been making soups all week – I’ve been in such a soup mood. And this one is officially next! Hope you enjoyed it, Susan! I’m starting to get into a soup mood, they are so yummy! Hi, Do you drain the tomatoes or do you put the tomatoes in with the juice? No need to drain the tomatoes, Marisa. Enjoy! The rosemary is key. We love this soup. Definite winner! Awesome! So glad you enjoyed it, Kathy! Is the rosemary prominent in this soup? I always worry rosemary will overpower the dish! I am not a big fan of tomatoes but I love tomato soup! My question is can this work with crushed tomatoes rather than diced so I don’t have to have the tomato pieces in my soup? Great question, Regina. I haven’t tried it, but it seems like it would work! Let me know how it turns out. I️I don’t like tomatoes and just use tomatoes sauce. It tasted really good. I’ve made the soup with crushed tomatoes and it was great! I don’t care for chunks of tomatoes either a on this was a win for us! I’ve used crushed tomatoes both times I’ve made this now and it is great! You can use an immersion blender before adding the tortellini if you want a smoother soup. Did you buy refrigerated tortellini? I used refrigerated tortellini, Christie. You may also use frozen tortellini, as well. Enjoy! What should I do differently if I’m using frozen tortellini? Great question, Camille. I would recommend not thawing the tortellini and adding it at the same time as the refrigerated tortellini. It may take a few minutes to cook. The tortellini does absorb some of the liquid, but it shouldn’t absorb it all. I notice if there are leftovers that most of the liquid is absorbed the next day. I haven’t had a problem with it after it was finished cooking, though! Would you recommend adding sweet Italian sausage to the soup? Hi Jen! I haven’t tried it, but it sounds like a great addition! I’m making this now but adding mild italian sausage and spinach… The sauce is delicious so far!! What can I use to substitute the heavy cream? Evaporated milk? Hi Theresa! I have not tried substituting the heavy cream. If you try it, please let me know how it is! I substituted with evaporated milk and turn out great! Very delicious! I used half n half. It worked good for me. Are you sure it’s 24 and not 28 oz. tomatoes? I’ve never seen tomatoes come in a 24 oz. can. Was making this but I’ll hold off until I hear from you. Thanks! Hi Mari! Thank you so much for pointing that out. I just changed it to say 28 instead of 24. Enjoy! If I don’t like chunks of tomatoes, what I can I use instead of the diced tomatoes for a smoother soup? Hi Megan. I have only tested this recipe using diced tomatoes. I would recommend subbing the diced tomatoes for crushed tomatoes. I will have to try it this way soon! I just used my immersion blender to make it more smooth as i dont like chunks of tomatoes in my soup. Its still cooking on the stove, but i tasted it and it came out nice. I used tomato sauce instead of diced and it turned out great. Cooking ahead and freezing for later. I made this tonight in the crockpot and it was so great! I used basil crushed tomatoes because I didn’t want chunks, subbed the tortellini for gnocchi only because I’ve made something similar to this before and it was too rich for me with the tortellini, and I also added spicy chicken Italian sausage! Turned out amazing, thank you!! Hi. Is the parmesan only a garnish? The recipe says 1/2 cup plus some for garnish. However i dont see where the parmesan is added to the soup during cooking. Thank you. I have updated the recipe, Thomas. Thanks for letting me know. Thank You Chelsea. It is a great recipe, we loved it. Just used the parmesan as a garnish this time and it was wonderful. Thank you. So glad you enjoyed it, Thomas! Rarely do I make something that *everyone* in my family adores, but this did it! It was so good. I can attest that crushed tomatoes work just fine. I did start off by cooking two sweet Italian turkey sausages, without casings, and then chopping them finely and adding them with the tomatoes. I don’t think the recipe needed it, but it pushed it over the top. This is delicious. A keeper! Thank you. Made this today.and it was WONDERFUL! I got numerous compliments. The only thing I did different was to use an immersion blender before adding the tortellini and the texture was amazing. I also added a tablespoon of sugar to round out the flavor. This soup is seriously amazing. My fiance jokes that this soup is the reason we got engaged! I’ve made it several times and always follow the recipe, it is so dang good! Just made this for dinner… SOOO GOOD! Only change I made was that I added a pound of browned ground beef. Great recipe – will make again. Thanks! Made this tonight! It was great. I added spinach for veggie. This is an amazing recipe! I love tomato soups and sauces but have never made my own. It is so delicious! And for anyone reading the comments, I used whole canned tomatoes and just sort of “smooshed” them as they cooked and there were no pieces of tomato in my soup. It was just a nice, smooth, delicious, mildly creamy tomato soup with tortellini, I did also have a problem with the tortellini absorbing too much of the soup but I had turned my back on it and it had boiled. No boiling next time (and there will be a next time!) and I may use half to two thirds of a package of tortellini. It’ll still have that tomatoey goodness and there will be plenty of tortellini to go around. I made this tonight, and it was delicious! I added sweet sausage and spinach. I’ll be making this again! Making this RIGHT NOW! 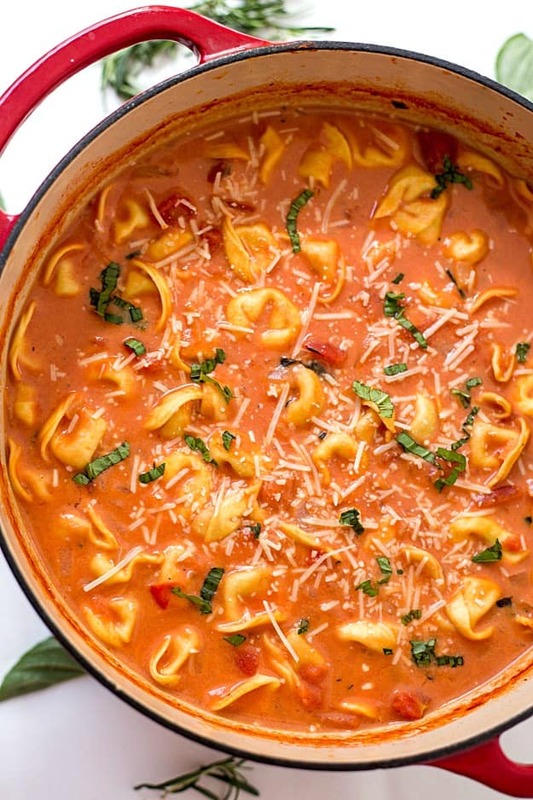 We love tortellini, and this looks incredible. First off, I just want to note that I have an EXTREMELY picky husband. I made this soup tonight, and he LOVES it. I blended up the diced tomatoes because he’s picky and doesn’t like th chunkiness of the tomatoes…weird I know! But this was a hit in our house and I’ll definitely be making it more often! I love this soup! Yum! My husband suggested making grilled cheese sandwiches to dip in it. It was too much food for me but perfect for my husband. I also added spinach in at the end and loved it! My family had a soup & salad night. My youngest son was skeptical, but when he tasted it he loved it! I will make this soup again, my family loved it!! I did use chicken & cheese tortellini so it could at some meat to the dish. And we ate it with garlic bread & grilled chicken salad. It was very filling. I couldn’t finish my bowl. My family loved this. Thank you. Going to try this for a Christmas ladies luncheon. Will add a tossed green salad and some warm Italian bread to complete the meal…yum. I may add some sweet Italian sausage , too, to make it a bit more hearty. I’ll also use freshly grated Parmesan reggiano for garnish. Hummm….and San Marzano tomatoes…yum, again. I made this for my family. They loved it!!!! I tried this dish today…it was AMAZING!!!! I’ll definitely be making it again! Making this tonight for 7 of us! Can’t wait to taste it! Thanks for the great recipe! I mean I have the Barilla kind, not the frozen kind. Hi, Great recipe thanks! I added some spicy turkey sausage. My family loved it. I wonder if using vegetable stock (to make the recipe vegetarian) would change the flavor drastically. Sounds fabulous!! It wouldn’t change the flavor drastically, Nikki. Try it! Would almond or soy milk suffice? Fabulous soup recipe! Simple and SO good! I was great so i caned it . i made 2 gallon and canned it in quart jars. So good! I had to use unsweetened almond milk as I’m gluten and dairy free. I made the tortellini on the side, so that the family could pour the soup over it. I also went with crushed tomatoes so that the soup had a very smooth, creamy texture. Everyone loved it! So glad to hear that, Dawn! I was tempted to use a jarred marinara sauce instead of following the recipe but Do Not Do It! The tomato sauce is perfect as is! Simply delicious!